It’s easy to lose sight of the big picture when you are specifying a geomembrane. There are numerous factors one must consider in order to choose the best fit for your application, however lifetime cost is often overlooked. In reality, a geomembrane with a low initial cost might cost you just as much, if not more than, a geomembrane that costs more upfront. Before signing the check, you should uncover the real cost of your geomembrane by looking at usual costs incurred over the lifespan of the product. To illustrate the point, this article discusses the differences between HDPE and EIA geomembranes (like XR-5). Regardless of the products you’re comparing, the cost breakdown categories will be relatively similar. Initial costs can be broken down into three main areas: material costs, installation fees, and the cost of construction quality assurance (CQA). Although material costs have a serious impact on the lifetime cost of your geomembrane, for less expensive materials, a good portion, if not the majority, of capital will be spent on labor. Below is a chart depicting some key differences. It is important to note that the EIA material costs above include both shipping and fabrication. The costs listed in this chart, for both geomembranes, are approximated and can vary based on the project size however. For example, larger jobs will have lower material and fabrication costs per square foot. 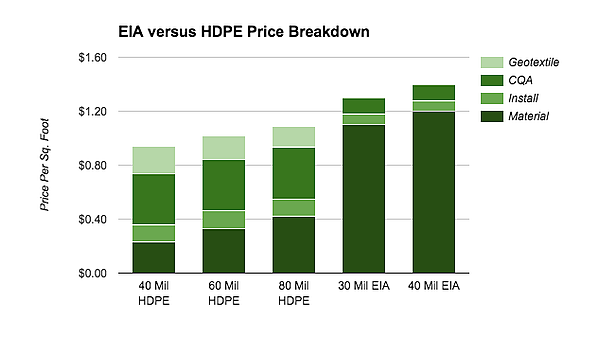 HDPE prices tend to fluctuate regularly as well, so be sure to reach out to the appropriate manufacturer when creating your own price comparison. 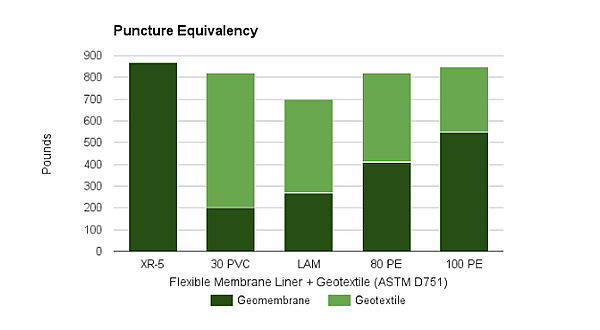 A rule of thumb for CQA - the cost is going to be much lower for flexible / fabricated geomembranes due to the fact that there are far fewer field seams. The final segment of the price breakdown shows the cost impact of adding a geotextile to a geomembrane. EIA geomembranes inherently have superior puncture strength, as they are able to withstand over 800 pounds of ball tip puncture resistance, so can often be used without a geotextile as depicted by the chart below. Other geomembranes on the market do not have that luxury however and need supplemental materials to increase puncture strength to the same level, resulting in additional costs to the overall installation price. Average lifespan should also be taken into consideration during this phase. A geomembrane possessing a successful performance record for over 30 years might cost more upfront, but the return on investment will be greater than that of a geomembrane with a lower initial cost that will only last 10 to 15 years. Your geomembrane must be maintained regularly in order for it to continue performing at its best. The amount of maintenance necessary varies however from one geomembrane to another. Some geomembranes, like HDPE, are plagued by environmental stress cracking (ESC), while others, like EIA, are engineered with low thermal expansion properties making these geomembranes more dimensionally stable. ESC can occur anytime during the lifespan of your geomembrane, meaning that you might have to replace the geomembrane entirely before seeing a return on your investment. Ultimately, you should not decide on a geomembrane solely based on the initial cost. Extra expense will sneak up on you, resulting in a greater lifetime cost. Make sure to do your research and weigh your options to find a product that fits both your performance and budgetary requirements. What other costs do you consider when determining the lifetime cost of a geomembrane? Share your thoughts in the comments.